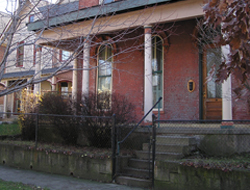 Fletcher Place Historic District developed along the Virginia Avenue diagonal and is one of the city’s oldest neighborhoods. Its residents made contributions to the development of religion, commerce, and education in Indianapolis. 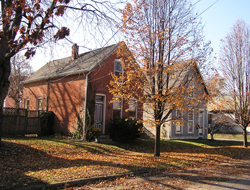 The neighborhood illustrates how the south side of town was settled, and in its combination of cottage and high style architecture, mixing of land uses and density, is representative of early Indianapolis as a whole. Influential early Indianapolis pioneer Calvin Fletcher owned much of the land in the area starting in 1825. The family farm, Wood Lawn, filled this side of town, with the family home located at the point of Virginia and Fletcher Avenues. Calvin was the first attorney in town. He also served on the school board and in the Indiana General Assembly, and established a bank that eventually became American Fletcher National Bank. In 1857, Calvin, his brother Stoughton, and a group of Ohio businessmen platted off much of Fletcher's holdings. The name “Fletcher Place” was in common use to describe the neighborhood by the 1870s. As with the Virginia Avenue Historic District, when Citizen’s Street Railway opened trolley lines on the diagonal avenue in the 1860s, Fletcher Place began to develop. Virginia Avenue became the commercial thoroughfare, and builders lined the other streets with a mix of vernacular and high-style houses in the late 19th century. The former Fletcher Place United Methodist Church on a prominent site at the intersection of Fletcher Avenue and Virginia Avenue is a good place to start an architectural tour of the neighborhood. The c. 1880 church is an imposing red brick building in the Gothic Revival style with stone sills and details. The design is unusual for its asymmetrical towers. Dr. Charles Tinsley, first pastor of the church, is credited with its design. The mid- to late-19th-century cottages on Lord Street are typical of many of the side streets in the area. Some houses, like 725 Lord Street c. 1865, are gable-fronted wood-frame Italianate cottages with circular attic vents, scroll brackets, and entablature headers over the windows. Fletcher Avenue was home to middle class families. One of the oldest houses is 601 Fletcher. This three-bay brick Italianate house dates to 1866. Andrew Wallace, a paper maker, likely hired well known Madison, Indiana, architect Francis Costigan to design the house. Up the street at the northwest corner of Fletcher and College stands the Laut Sheet Metal Shops. Henry Laut, a German immigrant, first opened a grocery in this building in the 1870s, but by 1892, Laut converted his building to tinsmithing. Laut and his crew built many sheet metal cornices and details for Indianapolis buildings here. Virginia Avenue was always in mixed use as the neighborhood developed. The former Fletcher School at 520 Virginia Avenue opened in 1857, and with additions, continued to serve as a public school into the 1970s. In the 1980s, the building was rehabilitated for office space and more recently has been converted to condominiums. Other avenue buildings date from a much different time. The former Virginia Avenue State Bank at 630-632 Virginia Avenue (1924) has a finely detailed architectural terra cotta exterior. Fletcher Place Historic District is located south of downtown. The district is bounded by Virginia Ave., I-65, and Lord St. Homes are private. Businesses and restaurants in the neighborhood are open to the public. Several eateries on College Ave. just north of Fletcher Ave. serve Italian cuisine. INDYGO bus line from downtown: #22 Shelby, disembark at South and Fletcher. The Joseph White House has been documented by the National Park Service's Historic American Buildings Survey.